Benjamin Franklin’s famous quote about the two inevitabilities of life being death and taxes is as true today as it ever was. And when it comes to that aspect of life most of us would rather not contemplate – many of us tend to bury or heads in the sand. This is natural; it isn’t pleasant to contemplate our inevitable demise and a will rarely needs doing urgently “today” so it’s always all too easy to procrastinate. Then when we do get round to making a will (which, by the way, most people still don’t) many of us simply get it wrong. Sometimes, the content and process of witnessing isn’t right, which invalidates the will or causes confusion after death – and sometimes, we simply don’t put in what we intended. For example; according to a recent repot from the Cabinet Office, over a third of us would like to bequest money or a gift to a charity in our wills, yet only 7% of people manage to do so. This startling statistic is reinforced by the Charities Aid Foundation, which recently published a report in conjunction with the charity “Remember a Charity”. The partnership found that a lot of people aren’t aware that it’s even a possibility to leave a gift or money to a charity when making a will. The study also found that around three times as many people in the UK would leave a legacy to charity if the person helping them with their will (usually their solicitor) reminded them that it was a possibility. Simply asking the question along the lines of “many people like to leave money to a charity when making their will; are there any charitable causes you’re passionate about?” can as much as triple the numbers of people including a charity in their wills. It also increases the amount donated in this way. This is very important. 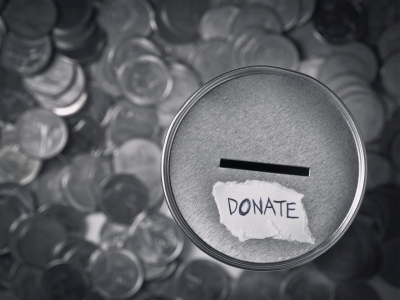 Most people would like to give a legacy to their chosen charity or charities – and it’s helpful for grieving relatives to know that a charitable gift has been made in line with a loved one’s wishes. It’s also important to remember that many charities rely on legacies to continue their good works – so charity donations in wills are vital. For example, the Guide Dogs for the Blind Association and the Royal National Lifeboat Institution couldn’t have achieved the marvelous results they have without the generosity of legators; people leaving a gift in a will. If you’re making a will, it’s essential to get the whole process right whether or not you want to leave something to a charity. It’s important to get the right advice and guidance. Blaser Mills can help with your wills or probates and should be able to advise you on the right sort of gift to leave a charity. Incidentally, charities always appreciate it if you let them know of your intention to leave a legacy – particularly a substantial one – as it helps them plan ahead. But if you do intend to do this – just remember that most people still don’t get around to it; and that’s a great shame. If you find yourself still wanting to give back after creating your will, then you should seriously consider donating your boats or vehicle to charity. This is not only a great way to clear up some space in your garage or yard, but it can even be used as a significant tax deduction. Once you donate your boat to a compatible organization, you will be able to help out a plethora of excellent causes. Taking a few minutes out of your day to look into your options could allow you to assist several great charities.